Downwasting of Icelandic glaciers causes perturbations in the Earth’s gravity field near Iceland according to a report by the Icelandic Meteorological Office which issued the following statement of their website. “Mass balance measurements carried out by the Institute of Earth Sciences at the University of Iceland and the Icelandic Met Office have shown that glaciers in Iceland have retreated and thinned steadily since 1995. The volume of the glaciers has been reduced by approximately 10 km³ per year on average. 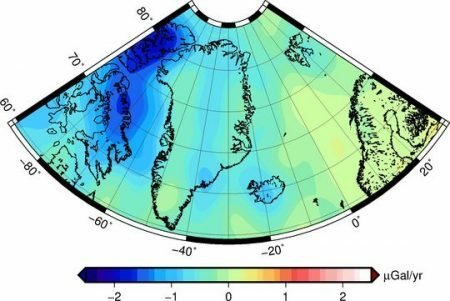 The mass loss of the glaciers causes perturbations in the Earth’s gravity field near Iceland that are detected by sensitive instruments on board of the German/American GRACE satellites. The two GRACE satellites were mainly intended to measure changes of the large ice sheets in the polar regions, in Antarctica and Greenland, and they have shown how the ice sheets have started to respond to anthropogenic climate change. The measurements are carried out by monitoring minute changes in the distance between the satellites that orbit the Earth in tandem at an altitude of approximately 500 km. Changes in this distance are used to calculate changes in the gravity field. These measurements have for example shown that the mass loss of the Greenland ice sheet doubled and the loss of the ice sheet in Antarctica tripled in the period from ca. 2006 to 2013, thereby demonstrating that the warming of the Earth’s climate has already had a substantial effect on the large ice sheets. The GRACE satellites were originally not intended to monitor changes of “smaller” glaciers such as the glaciers in Iceland. Many factors have to be taken into consideration and several corrections applied in order to measure mass changes of small glaciers, including the effect of vertical crustal movements induced by changes in glacier loads over the last century on the gravity field (so-called glacial isostatic adjustment or GIA). Such crustal movements are very rapid over large areas in Iceland, particularly in the southeastern part of the country. This type of analysis has now been carried out for the Icelandic glaciers in a collaboration between scientists at the Danish Space Institute (DTU-Space) and Icelandic glaciologists as a part of the Nordic Centre of Excellence SVALI . The results are in agreement with the rapid glacier down­wasting indicated by the traditional mass balance measurements that show that the volume of the glaciers has been reduced by more than 200 km³ in total since 1995, see fig. 3, as described in a new scientific publication in the journalGeophysical Journal International . Since the measurements determine changes in the total mass of the glaciers, one may say that the glaciers have been weighed from space in this study. 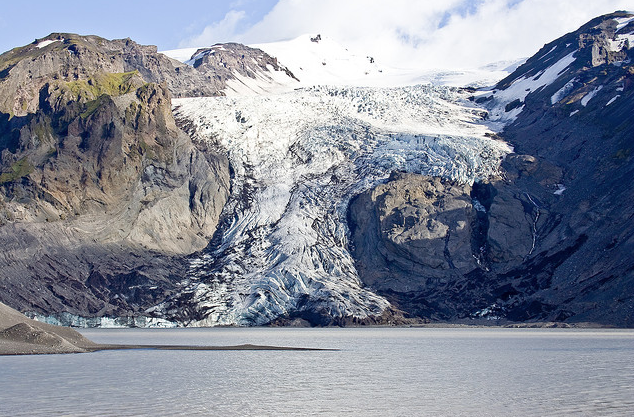 The analysis of the GRACE measurements shows that glacier isostatic rebound due to the reduction in glacier mass compensates for about half of the direct gravitational signal of the downwasting glaciers in Iceland. Thus, it is very important to correctly account for this effect. 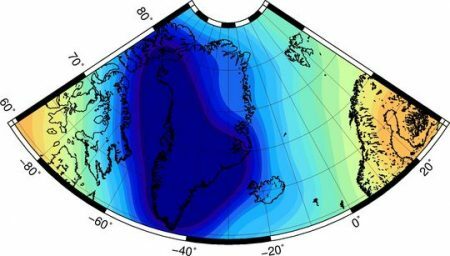 The analysis also shows that changes in the mass of the Greenland ice sheet have a great effect on variations in the gravitational field near Iceland, as clearly shown in fig 1. This influence from Greenland is believed to be important for future sea-level rise near Iceland which will most likely be less than half of the global average sea-level rise. This arises because the gravitational pull on the ocean waters near Iceland will be reduced in the future due to the diminishing mass of the Greenland ice sheet. Change in gravity field over the N-Atlantic, Greenland and eastern Canada [micro-Gal/yr] observed by GRACE (upper figure) and after removal of the effect of glacier isostatic rebound and mass changes in Greenland (lower figure). The light-blue area over Iceland on the lower figure reflects the downwasting of the Icelandic glaciers. 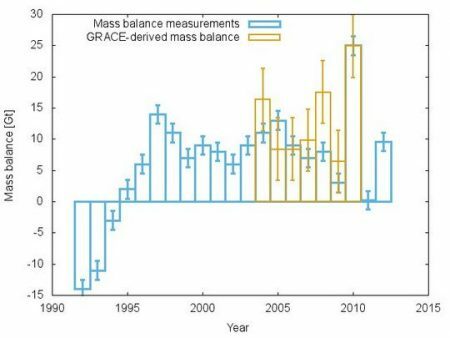 Yearly mass balance measurements of the Icelandic glaciers 1992–2012 (data from the Institute of Earth Sciences, University of Iceland, and the Icelandic Meteorological Office) shown with GRACE-derived annual mass balance estimates 2004–2010″.